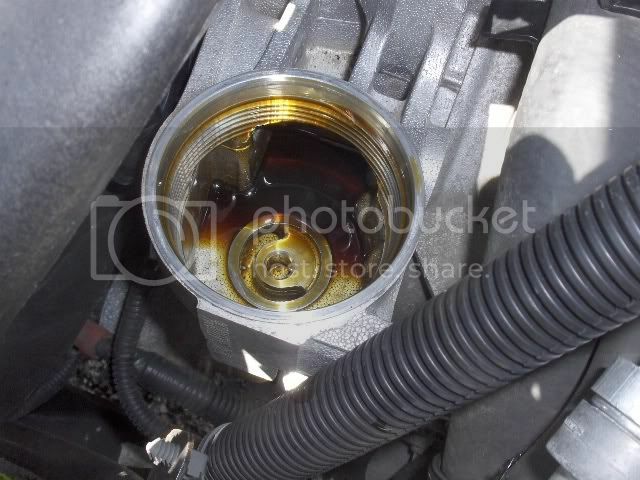 Does anyone have pics of the oil passageways in the filter housing on the engine? I am curious how the oil flows. The oil enters the housing from an opening near the top of the picture; it goes through the filter media and exits through the horseshoe-shaped opening in the bottom. The small opening in the center of the bottom is a drain that is normally plugged by the O-ring on the filter. With the engine off, the housing remains full of oil. When you unscrew the filter cap and remove the filter, the O-ring opens the drain and the oil runs out. In other words, the filter stays full when you shut off the engine so its always primed for your next startup. Thank you very much! That makes a lot of sense and answered all of my questions. does the tc take 6 1/2 quarts also? well, it might have been if I had the right size socket! So thanks for posting that method. I did my first since my car's out of warranty and I'm not paying the stealership to do it any more. $42 for oil, $8 for a filter (oh and $8 for the 1 1/4 in socket! Thanks to my fellow Seecarclub dude! Think Autozone or Pep Boys will have the filter? Actually to make things better Pep Boys is lame about it. All they have is the Purolator model not the AC Delco, FRAM, or Pure One...Nice right? At least the Purolator gets 97.5% efficiency (not the Pure One 99% but I'll have to order that and time doesn't permit that for this change, which I'm doing in about 20 minutes). Another thing too is the manual says the engine only has 6 qt of oil so I don't know why people are throwing in more unless there's something additional for that extra half a quart or more. Well I did the change and let me explain this nightmare. 1) Ramps I had weren't low profile enough so the bumper would have been torn off and I loathe jack stands so that was another trip to Pep Boys. So finally after I get everything, put the car back up on the ramps it's fun time. I go for the filter first since it is the hardest. The cap unscrews oh so easily but trying to get it and the filter off is a totally different story. Unfortunately, my arm just doesn't bend the way GM envisioned when they stuck that supercharger on the motor so it took me quite a while just to get my hand in the proper position to get the cap off and pull the filter out of the slot. I had to go under the supercharger because my arm's too big to go in from the top. Once off, there wasn't much problem getting the new one in, replacing the gasket, and recapping it. The oil drained out easy enough and yes that Saab on the bottom was pretty neat to see and kind of funny. I guess the Cobalt isn't really a true Chevy (but what really is pure to one company anymore anyway, no biggie). 6 quarts went back in though. Dipstick or not I'll follow the manual. I don't want to cause any damage to the engine. As long as he puts in the right amount and the engine is leaking oil, it should be fine. Most dipsticks do not reflect the proper level anyhow. In every Ford I've owned, the proper fill amount results in the oil level somewhere between MIN and MAX. The only Ford that has a properly marked dipstick is my 07 Mustang GT. 6 qt (called out in the manual) with a filter change puts me right at the MAX mark. Precisely. It isn't leaking oil and I put in the 6 quarts like the manual said. I think that GM would know what to print in the manual. If it needed more than 6 quarts they'd say that it needed more. They aren't going to print the wrong quantity, cause damage to the engine, and thus be liable for it. She runs just fine, there are no lights on, and nothing leaking. Mac tools sells the oil filter socket for like $12 and it's cast aluminum so that you really can over torque the cap down. Update: Checked my oil this morning after letting it sit a good 10 hours, shows max level. So that being said, 6 quarts of oil looks to be correct. The reason i posted the update on the amount of opil is because this whole damn thread people have been arguing about how much oil to put in the car. 32 mm is *slightly* larger than 1.25" (we're talking less than 1%), so if the 1.25 fits, that's your best bet. But like you said, either should work fine. Not like you're torqueing it to 100lbft or anything. Will this work the same way on a 2009 Cobalt SS/TC? Yeah, same filter and same location - it's actually much easier to reach. The charge piping is kind of in the way, but not nearly as bad as the supercharger. Definitely recommend a 12" extension. My car is still running great with the mobil 1 0w30 and napa gold filter. I have gone 5500 miles now but this weekend I am doing the oil change. I have read though you can run mobil up to 10k miles as long as you change the filter out. Can anyone verify if this is true?